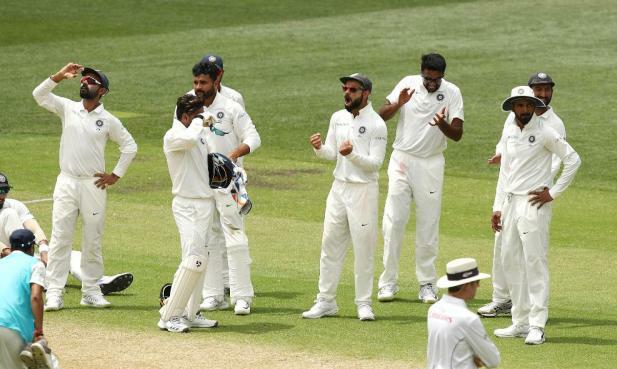 ONI Bureau: In reply to India’s first innings score of 250, Australia finished Day 2 at 191/7 at the close of second day’s play and still trail by 59 runs. Earlier, Indian side bowled out for 250 in the first innings. Pujara was the top scorer with 123. Rohit Sharma scored 37. For Australia, Hazlewood took 3 wickets, while Starc, Cummins and Lyon took 2 wickets each. Australia batted very slowly and the batsmen remained defensive throughout the day. They finished at 191/7 at Stumps. Travis Head remains unbeaten on 61, while Handscomb scored 34. For India, Ashwin took 3 wickets, while Ishant and Bumrah took 2 wickets each.